French special ability gives bonus to mid-game wonders. 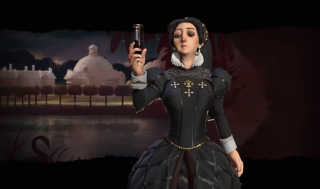 Catherine de Medici is your leader if you choose to play as France in Civilization 6, and as a new trailer reveals, her specialities are related to espionage and mid-game wonders. France is also the only nation able to build châteaus, which is fair enough considering I had to google how to spell the word just now. Châteaus take the form of tile improvements, and you'll have to build them next to rivers, OR ELSE. (Or else the game won't let you, basically.) They'll generate culture, with bonuses depending on how near wonders they are. Firaxis and 2K have previously shown off Civ6's Chinese and Aztec civilizations, the latter available three months in advance if you pre-order.